R T Resources Ltd is a GQA Approved Centre based in Ayr, Scotland. They have been delivering SVQs and Modern Apprenticeships to the glass and glazing sector since 2005 and in May 2011 began delivering to the automotive glazing sector. RT Resources recruited an experienced Automotive Glazing Assessor and have accessed funding for Modern Apprenticeships for employees of all ages. 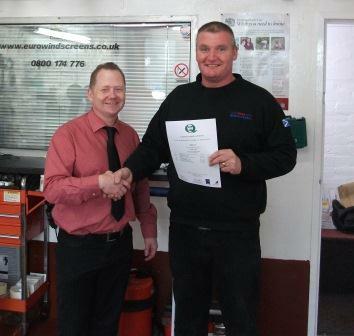 Recently the Centre had their first Automotive Glazing ‘achiever’ when Euro Windscreens' Alan Love, pictured right receiving his certificate from Colin Paterson of RTR, achieved his Modern Apprenticeship. He went on to say “It’s great to have a local company providing qualifications in automotive glazing. The automotive industry needs to tighten regulations and build consumer confidence to ensure everyone’s confidence, but this has to be achievable within the workplace especially for smaller businesses. Many thanks to R T Resources Ltd for helping me achieve where others let me down”. Claire McCallum, CEO of R T Resources Ltd, said, “I’m delighted that Alan has completed his Modern Apprenticeship in Automotive Glazing, our first in Scotland. As the only Scottish based provider of Automotive Glazing SVQs and Modern Apprenticeships, we hope that his achievement will encourage others in the industry to follow suit in gaining a nationally recognised qualification with our support”.